Today’s guest is Natasa Kajganic and I’m so excited to host her on this Slow Flowers Podcast Episode because together we’re celebrating the debut of Canadian Flowers Week, which begins tomorrow, September 13, and continues through September 16. 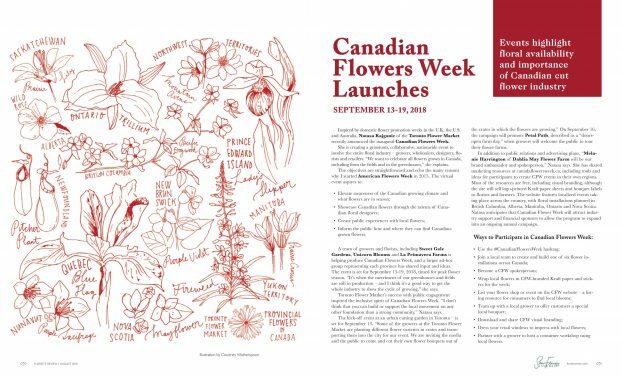 The origins of Canadian Flowers Week were a few years coming and truly began when I met Natasa last summer at the ASCFG regional meeting in Ontario, Canada. After a morning of flower farm tours, we gathered at La Primavera Farms in Dundas, outside Toronto, for a series of presentations, one of which was from Natasa. 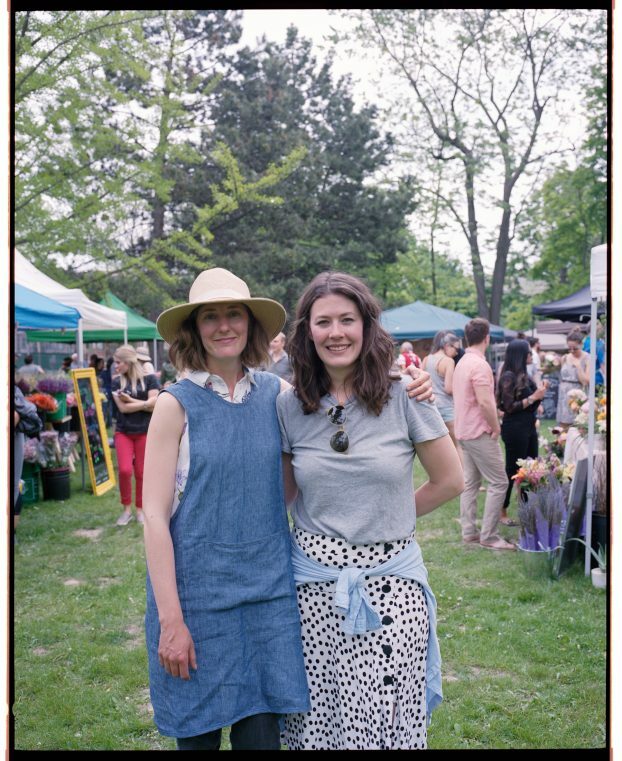 I’d long been wanting to connect with her in a meaningful way, as I’d heard so much about this truly original thinker who created Toronto Flower Market in 2013. 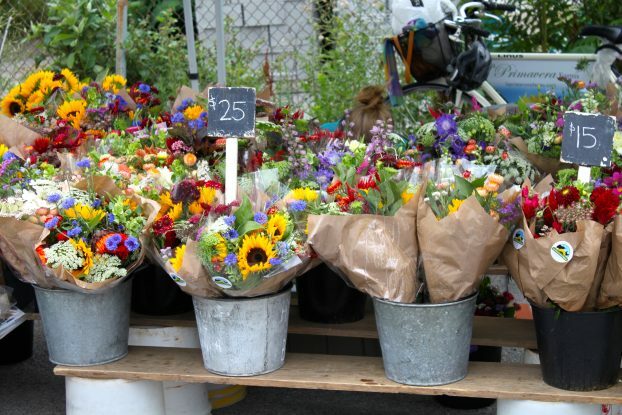 Toronto Flower Market is an outdoor flower and plant market that has become the city’s dynamic botanical hub for flower farmers, designers, and lovers of fresh, local and seasonal blooms. As founder of this botanical emporium, Natasa’s aim has been to bring focus to the local flower industry through inspiring public floral experiences. 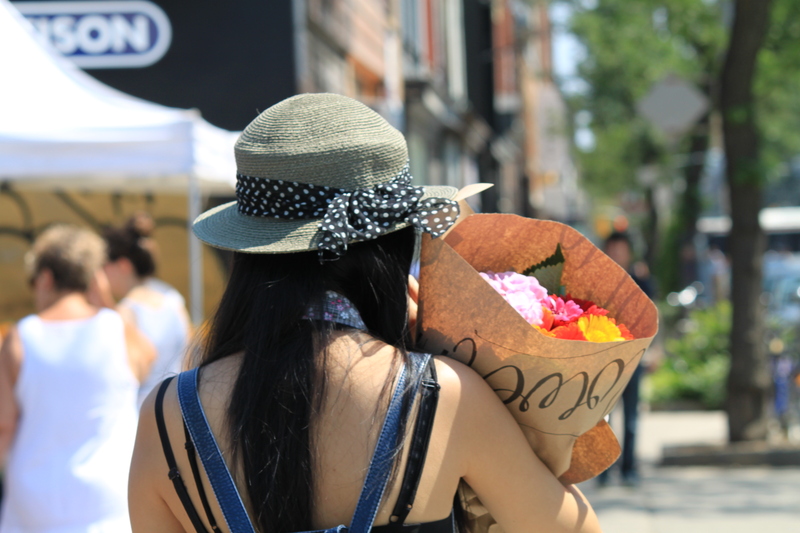 A glimpse over the shoulder as a Toronto Flower Market customer carries her purchase. I loved hearing Natasa’s presentation about the formation of Toronto Flower Market and after we met in person, we agreed to speak later by phone to brainstorm whether American Flowers Week could help bring Canadian Flowers Week to life. Much as I was nurtured and encouraged in 2015 by Helen Evans and others involved in British Flowers Week, I wanted to “pay back” a flower sister by encouraging Natasa and by sharing my experiences. 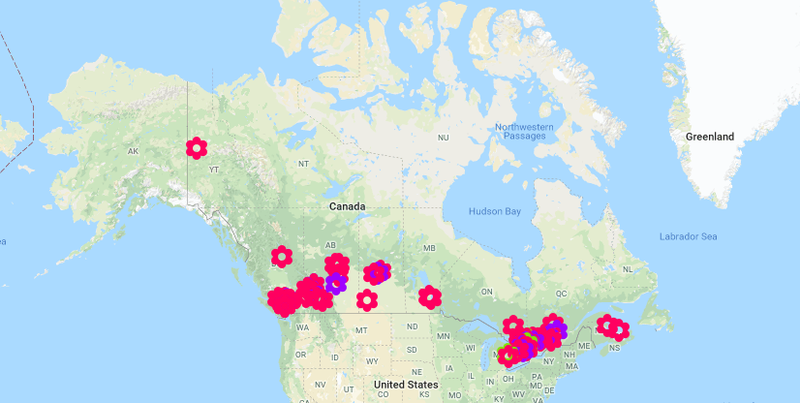 Canadian Flowers Week participation across Canada is revealed in this country map. Fast-forward less than one year later and Canadian Flowers Week is here, as a project of Toronto Flower Market. Florists’ Review and the Slow Flowers Journal featured this new Canadian floral holiday in the August issue. I’m so excited that you can hear from Natasa in person as she describes the participants and activities of this week-long celebration stretching across Canada, including activities in all provinces and 20 public events. Gotta LOVE the “pledge” badge that is used by Canadian members of Slow Flowers. 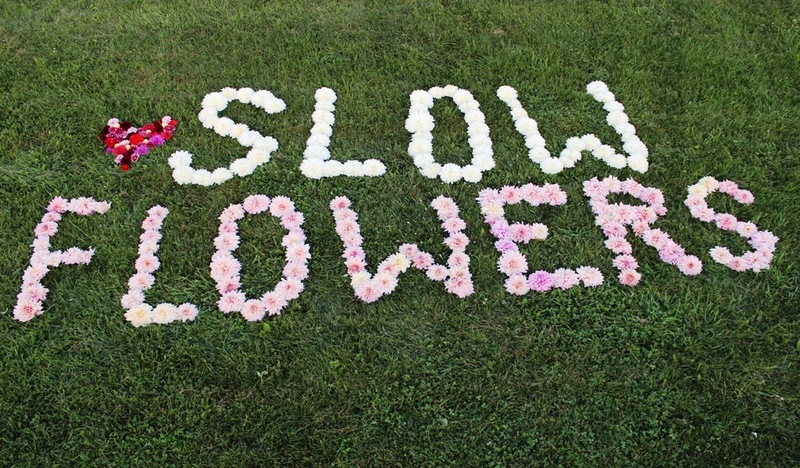 I’ve added links to my two recent articles that appeared in the August 2018 Slow Flowers Journal inside the pages of Florists’ Review. The first is about Toronto Flower Market, called “The Flowering of Toronto,” which you can download here. 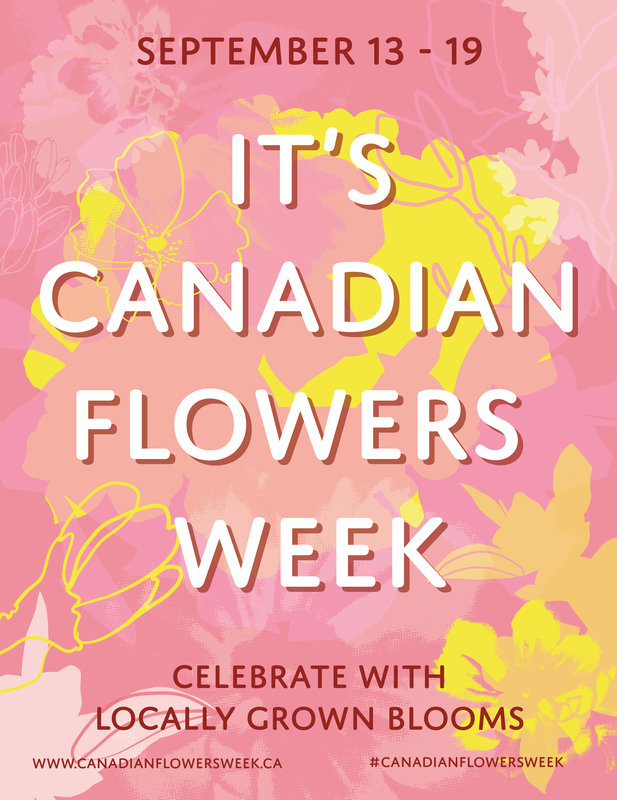 The second is all about Canadian Flowers Week, featuring an interview with Natasa Kajganic. Fresh, local and seasonal blooms at Toronto Flower Market. 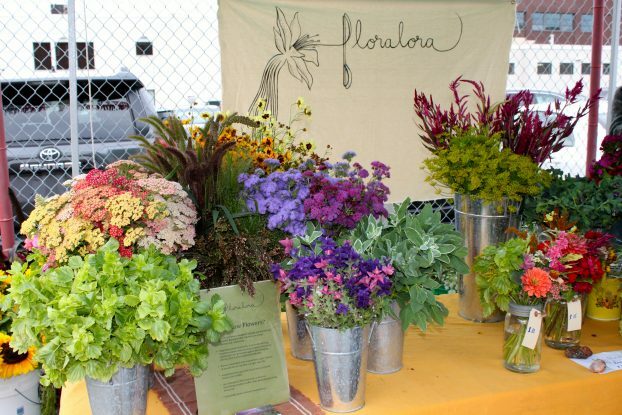 The Market will host Canadian Flowers Week events on Saturday, September 15th. While I launched American Flowers Week as a program of Slow Flowers in 2015, and as we are gearing up for our 5th year as the original domestic flower promotion holiday in the U.S., I have to reflect on the meaning of community. That undertaking would not have gained traction and support without the involvement of people along the entire floral continuum — from seeds and plants to growers, marketers, retailers, designers and floral consumers. Flowers from Floralora, a Slow Flowers member based in Ontario, on display at Toronto Flower Market. 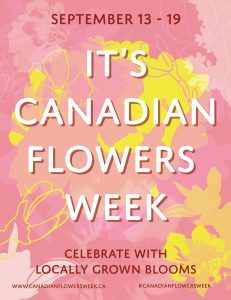 Similarly, Natasa has acknowledged her core team of creatives and fellow floral professionals who are helping make Canadian Flowers Week a reality. 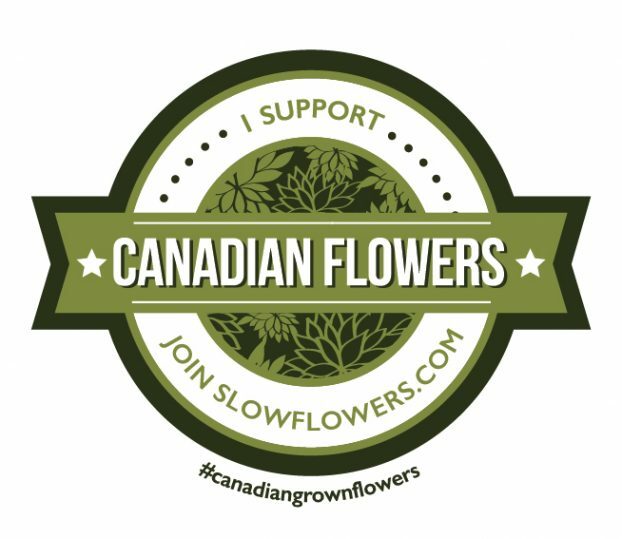 I’m so touched that the site includes a link to Slow Flowers and a mention of American Flowers week as key “partners” in this program, along with the Association of Specialty Cut Flower Growers, the Ecological Farmers Association of Ontario and several other supporting organizations and businesses. I wish them a fabulous kickoff as they continue to change the conversation around local, seasonal and domestic flowers in Canada. Similarly, I am so grateful to you — and to our entire community of flower farmers and floral designers who together define the Slow Flowers Movement. As our cause gains more supporters and more passionate participants who believe in the importance of the American cut flower industry, the momentum is contagious. The Slow Flowers Podcast has been downloaded more than 358,000 times by listeners like you. Thank you for listening, commenting and sharing – it means so much. This entry was posted on Wednesday, September 12th, 2018 at 4:23 am	and is filed under American Flowers Week, Blog Posts, Creativity, floral design, Flower Farming, Podcast Episodes, SLOW FLOWERS Podcast, Slowflowers.com the Directory of American Flowers. You can follow any responses to this entry through the RSS 2.0 feed. You can leave a response, or trackback from your own site.